Rosaly Correa-de-Araujo MD, MSc, PhD, Director of Women's Health and Gender-based Research at the Agency for Healthcare Research and Quality/ NIH, will be joining the Women's Heart Foundation May 14 at Mercer County Park as National Honorary Chairwoman for its 3rd annual RUN FOR YOUR HEART event. more. What are " Advance Directives" and patients' rights and how does this affect self-determination when faced with a major health crisis like open-heart surgery? Attorney Robert Romano explains this complicated area of medicine and the law and how to protect your right to informed consent. more. Blanch collard greens about 2 min in large pot of boiling, salted water. Drain and set aside. Heat oil saute pan on MEDIUM. Add onions and cook, stirring occasionally, about 5 min, until translucent. Add chicken broth; bring to boil. Add jalapeno pepper and greens. Simmer, stirring occasionally, about 20 min. Stir together sugar and vinegar until sugar almost dissolves. Stir into greens along with red pepper flakes. Recipe featured in Wegmans Menu Magazine, Holiday 2005, on pg. 37. Nutrition Info: Each serving (about 1/2 cup) contains 60 calories, 9g carbohydrate (2g fiber), 1g protein, 2g fat (0g saturated fat), 0mg cholesterol and 190mg sodium. Go to website for customer feedback. 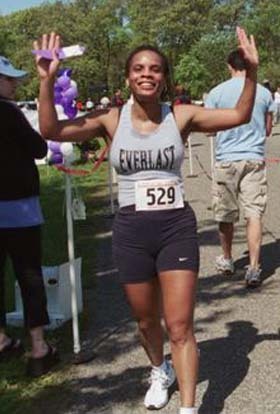 An exhuberant runner crosses the finish line in winning style at a RUN FOR YOUR HEART Mother's Day weekend event. WHF enjoyed perfect weather at Mercer County Park in New Jersey. While attending the First World Congress on Gender-Specific Medicine this past February in Berlin, I was enlighted not only by the information I received from world leaders, but also by the european culture and how the city of Berlin promotes health and exercise. We were well-fed at the congress with nearly a full meal served to us every 2-3 hours during breaks, and there was always an abundance of fresh whole fruits and vegetables incorporated into every menu. Trains circle the city and trolleys and rail cars traverse it. There was easy access to public transportation from all points. Thoughtful planning ensured safe walke and bike paths with a 10-foot-wide shared space, delineated by striping. I missed the marking at first, and one cyclist delivered me a few expletives (in German, of course). Bike lanes meander from sidwalk to street, but always with dedicated space for safe travel. While Berlin is not a beautiful city - most of it being destroyed during World War II and hastily bebuilt - it is none-the-less a town of warm and welcoming people, robust activities, and delicious foods (no fast foods). There are many historical sites of interest to visit as well. I found it interesting that I didn't see one obese person in Berlin. Not one. Can we achieve similar goals in America to promote healthier, more active citizens? Can we make our towns safer for bicyclists and pedestrians to share paths? Can we create interesting destination points? Well-connected public transportation systems? Gender Medicine needs to include quality of life at the grass-roots level with politicians and members of government taking the lead and joining with the medical, social and scientific communities to create healthier, more active communities.